rec. American Academy of Arts and Letters, 2005-2006. 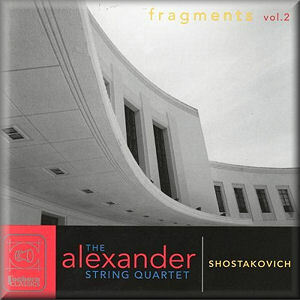 Called Fragments, the booklets for both volumes of this cycle of the Shostakovich string quartets begin with a T.S. Eliot quote, “These fragments I have shored against my ruins”, from The Waste Land. If you’re anything like me, you’ll get this set home, and dive straight for the last track on disc 4, intrigued to hear what new Shostakovich sounds are on offer from the 1961 unfinished string quartet fragments. Well, you may be in for a surprise, since Foghorn Classics have put in a little unlisted trademark track of the sound of a foghorn, track 19, where the fragments are on the penultimate track 18. There, now I’ve spoilt it for everyone, but at least I’ll receive no ‘aghast’ e-mails accusing me of not having listened to the thing. These little extras crop up elsewhere, and in my view are something on which this label will have to think seriously about economising – especially in repertoire of this seriousness. The Alexander Quartet performed their cycle of the complete Shostakovich string quartets at the Baruch Performing Arts Center in New York in 2006, coincidentally as the Emerson Quartet were doing the same thing just down the road in the Alice Tully Hall. A review in the New York Times actually preferred the Alexander over the Emerson Quartet, so there can be little doubt that these recordings promise to be in the top rank of recent surveys of these works. The writer also pointed out that, while the one ensemble received numerous awards, the other seemed to go more or less unrecognised by the higher echelons of commercial and artistic life. The Alexander Quartet does well enough, but with the Emerson Quartet’s Deutsche Grammophon Shostakovich cycle review having for instance won a Gramophone Award I do wonder what kind of attention this new Foghorn Classics cycle will be given. There’s an irony about writing reviews, and I am sure there are colleagues who would agree, that it is relatively easy to write a critical commentary of a performance or recording which has plenty of faults, or which is just plain beige. One can get down to work, pointing out weaknesses while balancing these against the positive aspects of a production and that of the competition, and before you know it the job is complete. Listening to these new Shostakovich recordings from the start, my immediate impression was that the playing lacked some of that intense grittiness I’m more used to hearing from my principal reference, that of the Fitzwilliam Quartet on Decca. I have spent a lot of time with the Alexander Quartet recordings however, partially thanks to a botched hernia operation which kept me off work for longer than necessary. As a result of this extra listening, I’ve come to appreciate how, as with their survey of the Beethoven Quartets, this ensemble clearly approaches the music with a view to its place in the composer’s timeline as well as purely on musical/aesthetic grounds. Both they and the Fitzwilliam Quartet allow the sunnier aspects of the music to sing through in the Quartet No.1, with those shades of angst held well in proportion. The dramatic extremes of the Quartet No.2 are, I think, more open to wider interpretation – is it dark or light, secretive or intimate? The Fitzwilliam Quartet’s view is I feel more on the dark side, bringing out the sense of mortality that the composer’s wartime experiences introduced. The Alexander Quartet introduces some more of the dancing qualities in the opening, perhaps emphasising more of the celebrations of heroism in the air at the time. Zakarias Grafilo has been the Alexander’s 1st violin for a while now, having replaced Ge-Fang Yang in 2000. His fine, deep tone gives the second movement’s Recitative a strong character, lightening like the opening of a stained-glass window into the faux-naive Romance which follows. Their third movement Waltz for me conjures the atmosphere of a smoky, dark wood-panelled interior, with this music coming to us on the soundtrack of a black and white film – the 78 rpm player’s horn introducing an element of sculpture into the picture. The muted strings repress the ebullience of the second section, maintaining that hazy image and introducing Shostakovich’s signature neurotic turbulence of conflict and struggle. The final Adagio Theme with Variations begins with less of a symphonic scale than with the Fitzwilliam, but this more gentle opening allows the music to develop and grow, the full impact of the final bars providing a true climax. For the Quartet No.3 I can offer a comparison with that lovely DG recording with the Hagen Quartett. The greater transparency this 2006 recording offers over the Fitzwilliam’s is punctuated with needle-sharp articulation and wide contrasts of tone and character. With equal technical panache and some subtle twists the Alexander Quartet create their own view on this seminal work. The opening is a little less jaunty than with the Hagens, more of a swaggering walk than a quasi-jolly dance. As a result, their sound in the following counterpoint is less urgent but no less characterful – it certainly avoids becoming laboured and static. Rather than go all-out with the pesante viola triad in the opening of the second movement, this becomes more of an accompaniment, allowing the flow of the upper instruments their full expression. On balance, the Alexanders for some reason sound slower almost through the entirety of this quartet, though the timings don’t always bear this out. They somehow convey the feeling of creating space around the notes even where the textures in the music would seem to make this as good as impossible. There is certainly no lack of urgency in the Allegro non troppo, and the subsequent Adagio refuses to ramble and lose shape, in this case shaving almost half a minute off the Hagen’s timing. I’m torn between these two recordings of this quartet, which has to be a good thing. I suppose a smidge more forward momentum might have given the Alexander Quartet the edge in the final Moderato, and a tad greater sense of involvement in the in-between tracts of this arguably over-long movement. I do however admire their sense of apocalyptic passion where the music demands, and their elegance of tone in the relatively high-pitched tessitura in this quartet. Come back to me in a year’s time and I’ll probably still be humming and hawing. The Hagen Quartett is lively and filled with contrast, but there are one or two moments of fast gear-change where I ‘notice’ them, not really a faltering, but having a moment of marginal discomfort where the Alexanders sail on regardless. Quartet No.4 is muted in more ways than one, with two of its movements being played with mutes, giving the instruments that hazy, secretive feeling. The rest of the piece is also very subdued in atmosphere, though the Alexander Quartet are sensitive to the changes of internal colour in each section, including the dance-like feel of the penultimate Allegretto and ultimately protesting final movement. The final blast of a foghorn is unfortunate. Once is a novelty, more than that is disrespectful to all concerned, and I’ll leave it at that. Coming back to this piece from the Fitzwilliam Quartet, and I find their silvery tone has a more chilling effect – less warmly intimate and more intense. It’s not that the Alexanders are cosily fireside cheerful, but by degrees one does sense something more of a connection with the Russian character from the Fitzwilliam Quartet. It’s as if the Alexander players take the work as the private statement it became, hidden from the public until the death of Stalin in 1953. From the Fitzwilliam Quartet it’s Shostakovich’s view on the Russian people through the wrong end of a telescope, dancing like puppets, or, awaiting the thaw; suppressed celebrations going on merely in their minds. These are two views with equal validity – and at least the Alexander Quartet is a clear winner in terms of intonation. Like its predecessor, the Quartet No.5 was held back from public performance until 1953, and with its dissonant complexities it’s not really hard to hear why this was the case. Eric Bromberger in his excellent booklet notes points out that this is one of the darkest in the entire cycle, and at over 30 minutes is a serious proposition for both players and audience. I won’t say the Alexander Quartet make it sound easy, but neither do they seem fazed by the extremes in the first movements. It is in this magisterial mastery of such technical obstacles that they win out over many other recordings, the tonalities remaining clear even when everyone seems to be trying to play as high as possible all at once. The jaunty character of the Quartet No.6 always comes as something of a surprise after all that almost silent intensity at the end of the fifth. Shostakovich had re-married, somewhat impulsively it has to be said, but the sunny nature of the music reflects some of the optimism he must have felt at the time. The Alexander players stroke the softer phrases with appropriate affection, but don’t hold back on some of the passages of conflict and strange passion in the opening Allegretto. The contrasting lyrical and rhythmic characters in the second movement are highly attractive, just the right amount of symbolism – if that’s what you are looking for: like two opposites which somehow attract and harmonise. Taking a break from the quartets, and I was delighted to see some of the Op.87 Preludes and Fugues, originally for piano, and arranged here for string quartet by Zakarias Grafilo. The effect with these arrangements is quite different to that of the same music on piano, but Shostakovich’s idiom in these pieces works extremely well for strings. The Alexander Quartet balance the voicing with easy expertise, which is essential for any kind of comprehension in this kind of contrapuntal music, but I was surprised to hear a moment or two of dodgy intonation in the Prelude & Fugue in C minor. The famous Prelude & Fugue in D-flat major opens almost inevitably rather heavier with strings, but the ear soon accepts the music on its own terms, and the textures are relieved by some gorgeously witty and well-executed pizzicati. The fugue itself becomes a new Shostakovich animal in its own right, with even more of the neuroses than you have with the piano version. The darkness of the Quartet No.13 is lightened in the final disc of this set, as it concludes with the sprightly Op.87 No.17. The parallel movements in the prelude create some interesting sonorities, and the fugue comes across with an almost naive sense of simplicity. Op.87 No.1 could possibly have used a little more space in the famous opening C major prelude – the strings could have sustained those chords so nicely, but at least they prevent the music turning into a church chorale. The fugue is one of Shostakovich’s most noble statements, and works well with strings. As ever with such transparent music, it is the intonation which proves more problematic than one might expect, and this fugue is full of niggly augmented and diminished intervals which do create some minor problems. My hat goes off to Zakarias Grafilo for his excellent arrangements however, and these pieces certainly make for equally, if no more effective string quartet music than some of those Bach Fugues. Another substantial extra is the Piano Quintet in G minor Op.57. Joined by the powerful piano playing of Roger Woodward, the quartet seems to shrink in size a little, and I would personally have had a little less presence in the piano sound. It’s partly sheer balance, but also that the piano is a fraction too far forward, which meant I felt a bit bludgeoned when those repeated high notes come in. The performance is very good however. I compared it with one of my favourites, that with the Nash Ensemble on Virgin Classics, and in terms of tempi and timings there is little to choose. Ian Brown’s piano is equally powerful here, but as a listener one feels at a marginally more respectful and realistic distance. The Nash Ensemble strings are a little more nasal, the Alexander ‘sound’ richer and warmer in general. As with the differences in character with the Fitzwilliam Quartet, this gives the Nash Ensemble an impression of greater intensity. Taken in isolation the Alexander performance is fine, with its own forceful sense of communication. It doesn’t however quite take your soul to the same pain barrier as some performances. I was interested to see that the 1950 recording made by Shostakovich himself with the Borodin Quartet differs from these interpretations, with significantly longer Fugue and Intermezzo movements, adding around two minutes to each. The sustained emotion created in these movements does take you to different worlds, especially in the Fugue. It is intriguing to make such comparisons and as a historical document this recording is priceless, but I have to admit the transfer on my 1991 Vogue CD is pretty atrocious in parts. Returning to the quartets, and we’re up to No.7. Remarkably compact at around 13 minutes, the striking pizzicato feature in the first movement is taken toothsomely by the Alexander players, with plenty of resonance and a fearless attack. Absolute rhythmic security is also an essential aspect of this piece, not only in the fast ostinati of the opening and final movements, but also in the wandering legato lines of the second. The Hagen Quartett undercut the Alexander by over a minute in this piece, a result of a brisker Lento and wilder finale. The Hagens have a lighter, more skittish view of the complex final movement, and it’s a question of whether you prefer this over the Alexander’s greater heft. There’s no doubt that the Hagen Quartett is extremely exciting, but you almost feel you have to look the other way in the presence of such almost indecently showy virtuosity. I do appreciate Paul Yarbrough’s rough viola entries in this movement, and find the overall impression to have more than enough grit and spirit. The final pages are indeed ‘haunting and moving’. Volume 2 of this set appears in a separate gatefold package with a clear family resemblance to the first, and begins with the ever so famous String Quartet No.8. As per expectations, the Alexander Quartet creates a fine atmosphere in the opening, although there are one or two places where I felt the width of some intervals received short change, with some resultant intonation questions. Such minor points are picky to be sure, but with boring old perfection as our goal they end up being mentioned, even when the performance of the piece as a whole is one of the strongest I know. The energy in the Allegro molto and Allegretto movements is high octane, and all the elements are present to keep bringing you back for more. The sheer texture in the sound of the quartet is worth mentioning here, but is valid for the whole set. All important is the resonant power of Sandy Wilson’s cello, underpinning the harmonies, but also capable of rattling your tonsillectomy scars at moments like the ferocious chords in the first of the two Lento movements in No.8. Zakarias Grafilo’s first violin can be gorgeously sweet over the top of everyone, but is held in reserve and very much part of the ensemble for most of the time – his genuine solos are special, but as with the cello, you are often barely aware of how his sound is so influential on the quality of the whole. Frederick Lifsitz’s second violin is slightly more elliptical in sound, supporting and refined, unobtrusive but in no way subservient. Paul Yarbrough’s viola can be like the deep furrow in a ploughed field of clay, cutting through with a life of its own, but as with all the other instruments it is chameleon, changing colour alongside the rest. Yes, I hear you say, but this is the way things should be with string quartets, and surely just typical good ensemble practice. Agreed – but don’t be surprised when you seek out some prime examples of flabby-vibrato 1st violin, arrhythmic 2nd, atonal violas or tubby cellos by way of a reply. Back to Shostakovich’s Quartet No.8, and it is clear that this ensemble have played this music until it has become engraved upon the whorls of their fingerprints. There are myriad other recordings, each with its own strengths, but as the music evolved I felt loath to drag them all in for post-mortem analysis. Rest assured, I promise this recording will do you just fine. The first recording of the Unfinished String Quartet fragment belongs around here as far as chronology goes. Shostakovich mentioned starting a ninth quartet, a work in ‘the Russe style’, which he then reported has having destroyed. Later, he indicated work on a children’s piece, but neither of these was the ninth quartet which eventually appeared in 1964. The fragment here was discovered in the Shostakovich archives in 2003, and the booklet notes carry further details on opus numbers and the like. Nobody knows to which of the two attempts the music belongs, but, while it is an interesting selling point for this set the fact remains that this is not Shostakovich at his best. Like other such fragments, such as the Grieg Piano Concerto fragment, you can hear the composer tugging at rather weak ideas and becoming increasingly fed up with the thing. It is very much characteristic of the composer, and carries his unmistakeable rhythmic and melodic fingerprints. What we do have is a fascinating glimpse of Shostakovich as a fallible mortal: into the soup pan which was thrown away because the burnt bits at the bottom were too gnarly to chip off – more trouble than it was worth to revive the thing, better off starting entirely afresh. The Quartets No.9 and 10 are just a little bit older than me, having been written in May and July 1964 respectively. Where some of the earlier quartets seem to reach for the skies in terms of range, both of these quartets often explore lower sonorities and darker colourations, sharing a more restrained emotional world. This restraint is well expressed in the prayer-like second movement Adagio of the ninth quartet, played with appropriately reserved vibrato by the Alexander players. The typical contradiction of dance and wit in an Allegretto which expresses anything but joy is excruciatingly well presented, as is the beatifically beautiful Adagio fourth movement. This is one of Shostakovich’s finest quartet moments, brutally interrupted by ugly pizzicato and empty dissonances: contrast to the nth degree, the violent passages pointing cruel bony fingers at such sentimentality. The final Allegro is treated with all the manic passion the music demands: The bizarre dances border on insanity, the cello solo is alarming and invitingly sensual at the same time, and the final pages are both affirmation and a kind of eternal damnation – a nice trick, if you can pull it off. Quartet No.10 might have opened with a little more of that secretive urgency which seems hidden in the music, but with an Andante marking the tempo here is nothing less than entirely legitimate. With the Allegretto furioso the quartet here sees ‘furioso’ more in terms of intensity of accent and ferocity of style rather than in any extremes of tempo, and as the density of notes builds one can hear how this works very well. Another Shostakovich masterpiece, the subsequent passacaglia movement is played with its own inner intensity, but with a simple lightness of tone which draws you in and becomes immediately involving, and moving. This is a crucial moment in the cycle, so I did refer once more to the Fitzwilliam Quartet recording. Here, there are some quite extreme differences, the Fitzwilliam calling out at once with an impassioned cry, a more rhapsodic statement which is more overt and immediate. As the Alexander Quartet began more softly, their even softer moments further in are transparent and precious, like fine silk. The Fitzwilliam players leave themselves more room to maintain that explosive potential, held within that tightly controlled intensity of sound. You pays your money …, and in the end I just find myself wanting both versions for all of those different reasons. The Quartet No.11 was dedicated to the memory of Vassily Shirinsky, for a long time Shostakovich’s friend, and second violinist in the Beethoven Quartet. This started a cycle of four quartets, each dedicated to its members. As might be expected, the mood is a sombre one, and at times the dry presentation of some of the opening thematic material seems to express the emptiness and futility of loss. 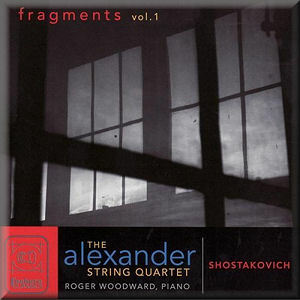 The sharpness of the contrasts come across like physical blows with the Alexander Quartet, and there is a steely edge to their sound in some sections which can be quite unsettling. There is great beauty, but no comfort in the exquisite dying moments of the conclusion. Quartet No.12 saw Shostakovich toying with the possibilities of using serial, 12-tone techniques in his composition. While there are some moments in which the tonality and melodic shapes become somewhat ambiguous, Shostakovich remained true to his own personal idiom, and the 12th Quartet is by no means an atonal or avant-garde experiment. There are some quite complex chromatic workings-out however, and this is one of those pieces which can be harder to make convincing. The Alexander Quartet have few problems, and take the Allegro opening of the elaborate second movement by the throat. This becomes an emphatic trait in the rest of the movement, with some of the effects reminding me of Shostakovich’s wilder moods, the mad crowd-like scenes in the earlier symphonies 2 and 3. With the Quartet No.13 we reach what might be described as one of the most extreme quartets in terms of structure if nothing else. The work is in one continuous movement, taking 18:30 for the Alexander Quartet, 19:10 for the Fitzwilliam. This single, arching form is dark in mood, and while the Alexander players don’t dig quite as deep as the Fitzwilliam Quartet, their impassioned expression of the most febrile moments has quite enough power. There is now a sense of grim purpose in Shostakovich’s writing, an ageing and frustrated fist battering against the transience of time – both for himself, and the 70 year old Vadim Borisovsky to whom the work is dedicated. The reference to Bartók is well made in the booklet notes, and the Alexander Quartet’s rattling taps and sharp pizzicati have potent resonance. The last of the ‘Beethoven Quartet’ quartets is No.14, whose bright opening shines like rays of sunshine after the gloom of the 13th. Dedicated to cellist Sergey Shirinsky, there are several showcase passages for Sandy Wilson, who gets his teeth firmly stuck into Shostakovich’s juicy lines. This is not a cello concerto however, and the quiet emotions of the central Adagio are initially painted with sober strokes in an extended threnody from the first violin. The third movement also has its minor tonalities, and the relationship between this and some of the austerity in the later symphonies is clear. Like the Quartet No.13, Shostakovich’s final work in this setting, the String Quartet No.15 was written while the composer was receiving treatment in hospital. Ill health and the shadow of death had their unmistakeable effect on this last quartet, which is composed in the form of six Adagio movements, one of which being a Molto adagio Funeral march. The second movement, Serenade, is a remarkable statement, with notes which seem to come at the listener like arrows out of the dark. The Alexander players are not above giving these darts a little vibrato here and there, which is other than most renditions I have heard, and certainly different to the needles which are driven under our skin by the Fitzwilliam Quartet. I don’t find this particularly disquieting, and the Alexander Quartet’s playing is excellent in this piece. Their overall impression is however one of deep sadness, where the Fitzwilliams give us the full tragic works: again, a change in emotional perspective which is different, equally valid, and in many ways complementary. There is more than one way to skin a cat, and when it comes to alternative recordings of the Shostakovich quartets I have “had ’em” through the years. Numerous sets have gone by the wayside, most of which having many positive qualities, but none speaking to me in quite the way that the pioneering cycle by the Fitzwilliam Quartet does. The Alexander Quartet doesn’t speak to me in the same way either, and nor would I want them to. We’ve come a long way since the 1970s, and I am open to all-comers in this repertoire, but the strength of expression in the playing has to match that of the music, no matter how an ensemble views it or makes its choices in terms of phrasing, balance, intonation and the rest. I still wouldn’t want to be without the Fitzwilliam Quartet’s cycle. This cries louder and is sometimes as painful as stripping post-operative plaster from a badly shaved wound, but not everyone will want their Shostakovich quite so raw and excruciating. The Alexander Quartet pulls no punches, but their recorded sound and general resonance tends to be warmer and less grittily challenging. In a direct comparison you may consequently find yourself less directly assaulted by the potency of the music, but with the Alexander Quartet we are also in for the long haul, and these are certainly recordings to which you will be more likely to want to return and explore. Ideally I would also have liked to have had the Emerson Quartet’s cycle for reference. I’ve had a listen to the extracts available on YouTube, and have the impression that the Emersons are more extrovert, with plenty of heart-on-sleeve passion and vibrancy. Listeners who seek a no-compromise “wring ’em dry” approach may wish to explore this as an alternative to the Alexander Quartet, though I am also informed that these are live recordings and include applause. A downside of the Foghorn Classics release is that sequence of novelty foghorns at the end of the discs. This label needs to grow up and ditch that kind of nonsense. I am assured that, thanks in part to my objections, all subsequent FoghornClassics releases (of which there are seven, to date) have been mastered without the hidden trademark Foghorn tracks. They have not been removed from the original Shostakovich masters. The initial production run is still not exhausted so there are still approximately 600 sets to be sold before that can be modified. I for one am however happy finally to have found a new ‘studio’ cycle of the Shostakovich string quartets which is the equal of the best in the current catalogue, and which both complements and challenges all those old favourites. To mix up a few metaphors, anyone seeking desert-island satisfaction should be able buy these recordings, and draw up the gangplank for a long time to come.